uuid : a675bed8-c206-483f-ba9a-36c15629669d templates_id: 119467 templates_uuid: "89e358e1-24be-427b-8719-0072ad140485" title: "Letter Accepting Payment in Instalments - Instalment Agreement" display_name: "Letter accepting payments in instalments" meta_keywords: "Payment plan agreement letter" description: "
If you\'ve received an offer by a debtor to pay off their debt by a regular fixed amount use this letter accepting payment in instalments to create a formal legal agreement for the repayment of this debt. This instalment payment agreement will help avoid any potential conflict by setting out clear rules for the repayment of the debt with the debtor. This letter accepting payment in instalments will outline the fixed amount as well as the time in which it is to be repaid. What\'s a letter accepting payments in instalments? A letter accepting payment in instalments creates a formal legal agreement for the repayment of debt. Why do I need a letter accepting payment in instalments? An instalment payment agreement will help to avoid any potential conflict by setting out clear rules for the repayment of the debt with the debtor. Why should I consider accepting payment in instalments? If one of your clients cannot make immediate payment of a whole debt, they may offer to pay off the debt by regular fixed instalments to avoid facing legal action. They can do this using a letter proposing payment in instalments. What\302\222s the advantage of accepting a proposal to pay in instalments? Entering a repayment agreement means that you can receive the money owed to you without having to take legal action. It can also be beneficial in maintaining a good business relationship with your client, especially if they are a loyal customer. Is this a formal legal agreement? Once signed by both the creditor and the debtor, a letter accepting payment in instalments becomes a formal legal agreement. Should I consider the client\302\222s previous credit history? Your client who is requesting payment in instalments may ask you to consider their credit history if they have generally been good at paying on time. It may also be beneficial to your business to consider their credit history in determining whether you can see them repaying the debt. You can respond to this request in an acceptance letter, taking it into account if you see fit. Your client may ask you to freeze interest and any ancillary charges on an outstanding amount in their request to pay in instalments. This is something you can choose to do in your acceptance letter. If you refuse, the repayment agreement may be subject to further negotiations before it is accepted by both parties. What are the alternatives to accepting payment in instalments? You can decide to enter into a loan agreement or use a promissory note. Read Loan agreements and promissory notes for more information. 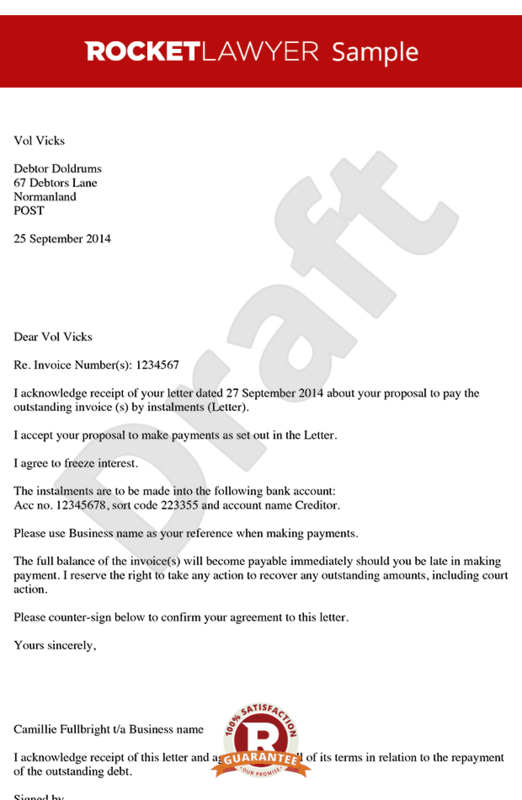 This letter accepting payment in instalments is governed by the law of England and Wales.
" created_timestamp: "2018-10-08 04:36:09.0" modified_timestamp: "2018-10-08 04:36:09.0" active: true created_by: 104 modified_by: 104 dcm_id: 267 url_slug: "Letter-accepting-payments-in-instalments" meta_description: "Prepare a letter accepting payment in instalments with step-by-step guidance from Rocket Lawyer. Avoid any potential conflict by setting our clear rules for the repayment of the debt with the debtor. Try this instalment payment agreement for free. " time_to_complete: "15 minutes" role1: "Creditor" role2: "Debtor"
If you've received an offer by a debtor to pay off their debt by a regular fixed amount use this letter accepting payment in instalments to create a formal legal agreement for the repayment of this debt. This instalment payment agreement will help avoid any potential conflict by setting out clear rules for the repayment of the debt with the debtor. This letter accepting payment in instalments will outline the fixed amount as well as the time in which it is to be repaid. What's a letter accepting payments in instalments? Whats the advantage of accepting a proposal to pay in instalments? Should I consider the clients previous credit history? More than just a Letter accepting payments in instalments template, our step-by-step interview and guidance makes it easy to create your document. Easily create online, download, print and sign your free Letter accepting payments in instalments in minutes. This document is also sometimes called: Payment plan agreement letter.